Jason Bodnerchuk throws the stone for Team McNeail Consulting as teammate Allen Meier looks on during the Mens Bonspiel at the Redcliff Curling Club on Feb. 1. Linda Asham took over the Redcliff Curling Club’s president position from Mavis Martin, who was at the helm for over 30 years. Now well into her first year there has been learning opportunities curled her way. “Probably just how much actually goes into behind the scenes like insurance,” said Asham. 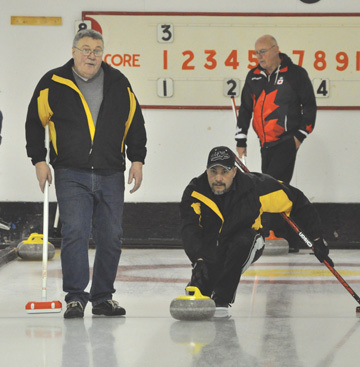 The challenge that has loomed over the curling club has been the lack of people involved running the building. “I think every year for the last 10 years, we’ve had the conversation of ‘Are our doors going to open?,’” says Asham. A seven-team open league runs on Tuesday nights with a mixture of male and female players, six ladies teams play on Wednesday nights and five mens teams play on Thursdays. Numbers are down a little bit from last year, she said. “We’re hoping the high enrollment in our juniors will help bring some more youth in our club,” said Asham. This year the curling club switched the junior league to a week night, which has seen an increase in players, she added. Two adult ‘Learn to Curl’ nights were hosted earlier this year for those interested in trying the sport, while Two Ends and a Beer for $5 and Glow Curl were also included in the club’s events. “Any time you can get people with new friends through the door, that’s a potential team for the following year,” said Asham. More information on leagues can be found at http://www.redcliffcurlingclub.com.